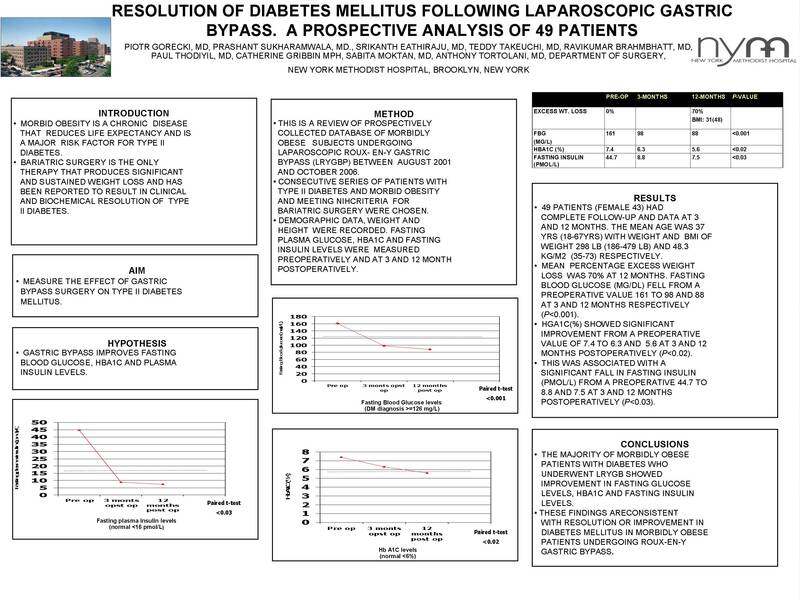 Resolution of Diabetes Mellitus Following Laparoscopic Gastric Bypass. a Prospective Analysis of 49 Patients. Introduction: Morbid obesity is a chronic disease that reduces life expectancy and is a major risk factor for type II diabetes. Bariatric surgery is the only therapy that produces significant and sustained weight loss and has been reported to result in clinical and biochemical resolution of type II diabetes. Methods: This is a review of prospectively collected database of morbidly obese subjects undergoing laparoscopic Roux-en-Y gastric bypass (LRYGBP) between August 2001 and October 2006. Consecutive series of patients with type II diabetes and morbid obesity and meeting NIH criteria for bariatric surgery were chosen. Demographic data, weight and height were recorded. Fasting plasma glucose, HbA1C and fasting insulin levels were measured preoperatively and at 3 and 12 months postoperatively.